Convert static designs into interactive prototypes. Is there a better alternative to ClickThru? Is ClickThru really the best app in Image Editing category? Will ClickThru work good on macOS 10.13.4? 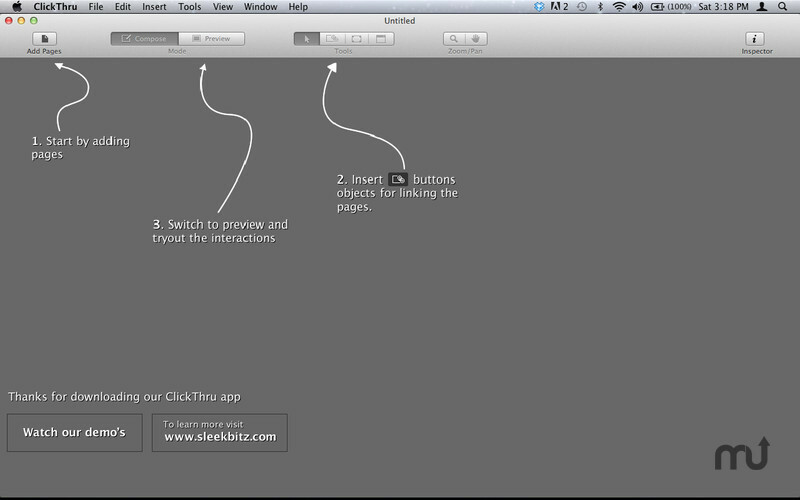 ClickThru is a tool to convert static designs into interactive prototypes. Import PNG/JPEG images as pages. Insert buttons and link to pages by simple drag drops. Add hover and selected states for buttons. Use Regions to load content in specific regions of the page in response to button clicks. Use Popups to demonstrate menus and popup dialogs. Transitions can be added to navigate between pages. Export HTML to share the interaction design with clients. ClickThru needs a rating. Be the first to rate this app and get the discussion started! ClickThru provides a seamless way to compose and preview the interactions. The download link points to the demo version, ClickThruLite.